(M1) and a variety of "premotor" areas, and the prefrontal zone, which comprises the remainder of the frontal cortex. The prefrontal zone can be divided into a medial region (consisting mainly of anterior cingulate cortex), an orbital region, and a dorsolateral region. Figure 6. 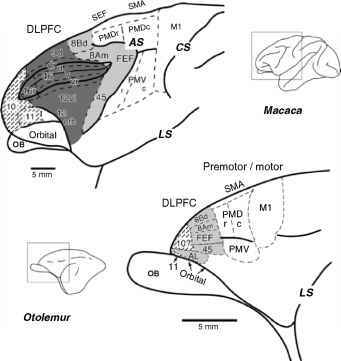 The lateral frontal cortex of the anthropoid primate Macaca and the strep-sirhine primate Otolemur, showing the location of proposed divisions of the dorsolateral prefrontal cortex (DLPFC) and premotor/motor cortex. The DLPFC areas are shaded or stippled here. In Macaca, the deep arcuate sulcus (AS) separates the motor region from the DLPC, and the central sulcus (CS) separates motor cortex from somatosensory cortex. Otolemur possesses no comparable, deep sulci. Recent studies have identified many new divisions of both cortical regions. 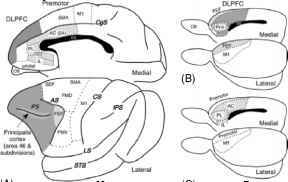 Macaca and Otolemur share a set of areas in DLPFC, which includes the frontal eyefield (FEF), but Macaca possess many additional areas, including notably the areas located within and surrounding the principal sulcus (P S), which include areas 46, 9, and 12 (and their many subdivisions). These areas are indicated by dark shading. Otolemur possesses one prefrontal area (the anterolateral area, AL) that has not been definitely identified in macaques. Motor cortex consists of a primary motor area (M1); dorsal and ventral premotor cortex (PMD, PMV); and a supplementary motor area (SMA), which includes an eye-movement region, the supplementary eye field (SEF). An SEF has not been identified in Otolemur. Additional motor areas are located on the medial wall of the frontal lobe and are not shown here. Area PMD consists of rostral and caudal subdivisions (PMDr, PMDc). Rostral and caudal divisions of PMV can be distinguished in macaques, but have not been identified in strepsirhines or in New World monkeys. Based on Preuss and Goldman-Rakic (1991a), Preuss et al. (1996), and Wu et al. (2000). Additional abbreviations: LS = lateral sulcus; OB = olfactory bulb. and anthropoid primates (Brodmann, 1909; Preuss and Goldman-Rakic, 1991a,c). By contrast, all nonprimates that have been examined lack a histologically granular frontal region in the location of primate DLPFC; the entire frontal mantle in these animals is agranular or dysgranular, like the orbital, cingulate, and motor cortex of primates. The fact that DLPFC has a distinctive histology in primates led Brodmann (1909) to conclude that this region is really well developed only in primates, and his cortical maps imply that most, if not all, the granular prefrontal areas of primates are unique to primates. Brodmann's views have not been universally acclaimed, for if correct they would mean that a region of great scientific and medical significance is not accessible for study in nonprimate mammals. A major program of research intended to identify nonprimate homologues of DLPFC was begun, which dominated comparative frontal lobe research from the period of the 1940s through the 1980s. This research is reviewed in detail by Preuss (1995a), which provides the basis of the following synopsis. Investigators took the following tack: perhaps the differences between primates and nonprimates are merely histological; in that case, one should be able to use other characteristics—connectional, neurochemical, or functional—to identify the homologue of DLPFC in nonprimates. So, for example, workers noted that primate DLPFC is the recipient of strong projections from the thalamic mediodorsal nucleus (MD) and from dopamine-containing nuclei of the brainstem, and that lesions of primate DLPFC produce deficits on spatial delayed-reaction tasks, which are thought to tap spatial working memory. These characteristics came to be regarded as the defining features of dorsolateral prefrontal cortex. Given the importance of rats as model animals, it is useful to consider the interpretation of rat-macaque frontal lobe homologies that emerged from this research. In rats, the medial frontal cortex (MFC)—that is, the cortex covering the medial surface of the frontal lobe from about the anterior end of the corpus callosum to the frontal pole—has come to be considered homologous to the dorsolateral prefrontal cortex of primates (Figure 7A, B).The densest projections from nucleus MD and from the dopaminergic nuclei target this medial region and the adjacent orbital cortex (which is presumably homologous to primate orbital cortex, a region that receives a similar complement of projections). In addition, a portion of MFC located in the cingu-late region immediately anterior to the genu of the corpus callosum (the prelimbic area, PL), has been proposed as the rat homologue of macaque principalis cortex, because PL appears to be the critical region for spatial delayed-reaction performance in rats. A region along the dorsal rim (or "shoulder") of the medal frontal lobe has come to be regarded as the rat homologue of the FEF, because electrical simulation of this zone elicits eye movements. Figure 7. Alternative interpretations of frontal-lobe homologies of macaques (A) and rats (B, C). Traditional interpretations of rat organization (B) identified the cortex occupying the medial wall of the frontal cortex with the dorsolateral prefrontal cortex (DLFPC) of primates. Within the medial frontal region, the cortex located on the dorsal margin has been identified specifically with the FEF and the cortex located anterior to the corpus callosum (CC) has been identified specifically with macaque principalis cortex (Prin). Traditional interpretations of rat frontal cortex either make no attempt to identify homologues of cingulate cortex (stippled), or treat the medial cortex as containing a mixture of DLPFC and cingulate characteristics. Preuss's interpretation (C) identifies the medial frontal areas of rats with the medial frontal areas of primates. In particular, the areas in rats situated immediately anterior and dorsal to the corpus callosum are identified with subdivisions of primate cingulate cortex, specifically the anterior cingulate (AC), prelimbic (PL), and infralimbic (IL) areas. The dorsal rim is considered to be premotor cortex. In addition to their positional similarities to the primate medial frontal and premotor areas, these areas closely resemble primate medial frontal and premotor cortex in histology, connectivity, and function. Under this interpretation, rats lack cortex homologous to primate DLPFC. Based on Preuss (1995a). Rat projections are not limited to DLPFC in primates, but instead reach virtually the entire frontal lobe, including the premotor cortex, orbital cortex, and the cingulate cortex (located on the medial surface of the frontal lobe). Dopaminergic innervation is similarly widespread, and in fact recent research indicates that macaque cingulate cortex receives a denser dopaminergic input than does DLPFC. Also, while lesions of the principalis region of DLPFC do indeed produce deficits on spatial delayed-reaction tasks, lesions of the medial wall of the frontal lobe in primates can also produce such deficits. Likewise, the status of the rat's shoulder cortex as an FEF homologue is compromised by recent findings indicating that eye movements can be elicited by stimulation of dorsomedial premotor cortex (including the so-called supplementary eyefield) in primates, cortical regions that more closely resemble rat shoulder cortex connectionally and histologically than does the DLPFC. For these reasons, Preuss (1995a) suggested that the rat MFC is actually homologous to primate cingulate and premotor cortex, or at least to portions of those regions. This interpretation is supported by many other features of histology, neurochemistry, connectivity, and function. From an evolutionary standpoint, therefore, there are no good grounds at present for supposing that DLPFC exists in any mammalian group other than primates. The identification of the rat's prelimbic area as a homologue of prin-cipalis cortex seems especially problematic: For one thing, the two areas fall within different developmental fields—PL is proisocortical, while principalis cortex is isocortical. For another, the principalis region is not even a universal feature of primate organization: as shown in Figure 6, the DLPFC of Otolemur—which in all respects resembles macaque DLPFC more closely than does the rat MFC—lacks a territory having the specific connectional and myeloarchitectonic features of principalis cortex (Preuss and Goldman-Rakic, 1991a,c). Increasingly, therefore, workers are emphasizing the similarities between rat MFC and primate MFC (see, e.g., Ongur and Price, 2000). This reevaluation of cortical homologies is a matter of some biomedical consequence, because MFC may be of even greater clinical importance than DLPFC. Frontal lobe changes in early primate evolution were not restricted to pre-frontal cortex—the motor region was modified as well. Classically, three divisions of motor cortex were recognized in primates: (a) the primary motor area (M1); (b) the premotor area (PM), located on the lateral surface anterior to M1; and (c) the supplementary motor area (SMA or M2), located on the dorsomedial margin of the hemisphere anterior to M1 and medial to PM. Research during the last decade has indicated that the classical M1 and PM areas actually consist of multiple cortical divisions, distinguishable on the basis of differences in histology, cytochemistry, physiological characteristics, and connectivity (Figure 6). In addition, several previously unknown motor areas have been identified on the medial surface anterior and inferior to SMA. No fewer than nine motor divisions are now recognized in the frontal cortex of anthropoids (Preuss et al., 1996) and strepsirhines (Wu et al., 2000). We currently lack critical studies comparing motor cortex organization in primates and a variety of nonprimate mammals. Modern studies of rodents and carnivores, however, suggest that these mammals possess many fewer motor divi-sions—perhaps two or three in rodents, and perhaps three or four in carnivores (Wise, 1996). Area M1 is the only motor area that can be identified with confidence across eutherian orders (Nudo and Masterton, 1990; Wise, 1996). It thus seems likely that at least some of the premotor areas of primates are unique to primates. On current evidence, the strongest candidate for a neomorphic motor area is the ventral premotor area (PMV), an area that has been characterized in catarrhine, platyrrhine, and strepsirhine primates (Preuss et al., 1996; Wu et al., 2000). In catarrhines, PMV can be divided into separate caudal and rostral zones, based on differences in connectivity and function. PMV has distinctive characteristics that are unlike any motor area known in nonprimate mammals (see especially the comparative study of Nudo and Masterton, 1990, and the review of Preuss et al., 1993). One particularly noteworthy feature is its somatotopy—whereas most motor areas represent the face, fore-limb, and hindlimb, PMV has sizeable forelimb and orofacial representations, but little or no representation of the body below the neck. In primates, the lateral premotor areas, PMV and PMD, play important roles in visually guided reaching and grasping (Jackson and Husain, 1996; Jeannerod et al., 1995; Wise et al., 1997). 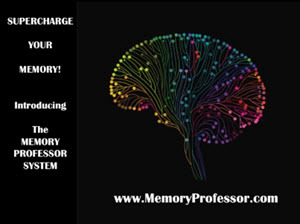 Both areas receive visual and visuo-motor inputs from the dorsal visual stream via connections with posterior parietal cortex. Area PMD appears to be relatively specialized for the control of orienting and reaching movements. Area PMV is involved in prehensive movements of the mouth and hands: neurons respond selectively when the individual performs a particular movement or observes the movement being performed; neurons that respond in both conditions have been dubbed "mirror neurons" (Gallese et al., 1996). Individual neurons respond in relation to specific prehensive actions, including precision grip, whole-hand grips, tearing movements, hand-to-mouth movements, and so forth (Gentilucci and Rizzolatti, 1990). Rizzolatti and colleagues suggest that PMV contains a "vocabulary" of motor acts (Rizzolatti et al., 1988).